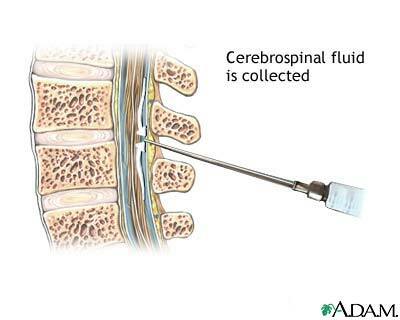 Cerebrospinal fluid (CSF) is a clear fluid that circulates in the space surrounding the spinal cord and brain. CSF protects the brain and spinal cord from injury by acting like a liquid cushion. CSF is usually obtained through a lumbar puncture (spinal tap). During the procedure, a needle is inserted usually between the third and fourth lumbar vertebrae and the CSF fluid is collected for testing.